Fifteen milking does were randomly selected from the Alpine herd of the Langston University farm, with five each in Parities 1, 2, and 3 (P1, P2 and P3, respectively). Composite milk samples of equal volume of morning and evening milkings were taken once a month throughout the lactation period of 8 months. All samples were analyzed for somatic cell count (SCC), standard plate count (SPC), and chemical composition (percent fat, percent protein, percent lacatose, and percent solids non-fat (SNF)). Milk production was recorded daily. All experimental does kidded in March and were dried off in October. No symptoms of mastitis were observed during this study. Overall mean SCC, SPC, percent fat, percent protein, percent lactose, percent SNF, and milk production were 1.2 x 106 cells mL-1, 9.5 x 103 colony forming units (cfu) per mL, 3.73%, 2.80%, 4.42%, 7.85%, and 2.69 kg per doe per day, respectively. Parity of does did not affect the variables significantly except for milk production. Does of P1 produced less milk than those of P2 and P3 (P < 0.05). 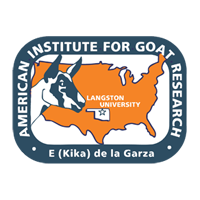 Goat milk samples contained high SCC and exceeded the 1 x 106 mL-1 requirement of the Pasteurized Milk Ordinance (PMO) during most of the late lactation stages, although mastitic conditions were absent in any experimental goats during the lactation period. Histological and pathological tests on fresh tissues of udder halves revealed no changes in mammary gland change or other mastitic evidence. High SCC in goat milk appeared to be natural, particularly in the late stages of lactation. Goat milk showed low SPC, indicating high microbial quality. SCC had a positive relationship with SPC (0.44) and was negatively correlated with milk production (0.46) and fat content (0.41). As the lactation progressed, SCC and SPC increased (P < 0.001) and milk production decreased (P < 0.001). SPC was negatively correlated with percent fat, percent protein, percent SNF, and milk production.